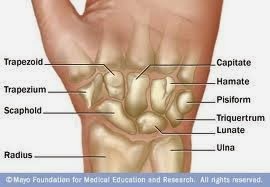 I have four distinct fractures in my Radius and one in my Trapezium. The surgeon will stabilize the Radius with stainless steel. Finding the fifth fracture near my thumb was tricky as was being able to locate the break in K's Scaphoid...which required an MRI. My surgery is scheduled for 11:30, should last about 90 minutes and then I'll spend a couple of hours in recovery. The CEO has donated car service to and from the hospital which we have gladly accepted. sending you and K all our love. Oh my dear heart. I was shocked to read this post. I am so thankful that you will be OK and you have people who are caring for you. I will light a candle for you at liturgy and carry you in my heart. Know this. Holding you tight in my thoughts. Sending love and prayers from Michigan. Youze two will be in my head all weekend - pay no attention to the other stuff that might be there. I'm so glad nothing sounds terribly permanent or debilitating. And I'm glad to hear the boys are doing a good job taking care of you both. How nice of your CEO to offer the car service. Hang in there BB, you and K will get better, I promise. Please don't cry, it breaks my heart. Just celebrate the fact that it wasn't mush worse. You both need to kick back and mend. Know that if I lived there I'd be doing the cooking - the cleaning not so much. That's why you had kids, remember. OMG - I just caught up on posts…. I am so sorry… This is terrible, but I can't help but think how worse it could be… Thank goodness your injuries are fixable…. Hang in there, both of you. YOu are both in my thoughts and prayers…. Thinking of you both. And kind thoughts to the CEO, as well.